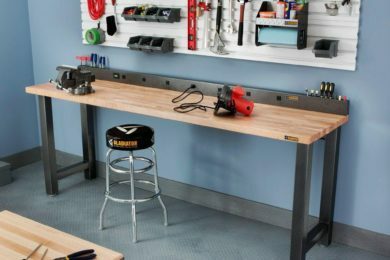 A Workbench for every size space. The Gladiator 4 & 6 ft. Adjustable Height Hardwood Workbench with Hammered Granite Finish ensures a perfect fit for every work space. The heavy-duty steel legs are as tough as they look and the robust 1-3/4 in. hardwood top supports up to 3,000 lbs. to provide a sturdy foundation to build upon. Add a stool or coordinating Modular GearBox for even more versatility.